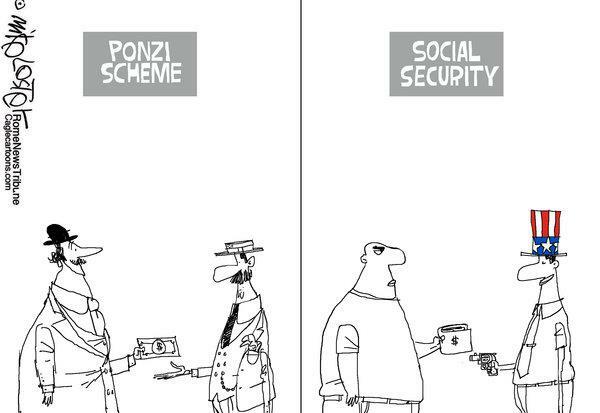 I was wrong yesterday when I said Social Security was akin to a Ponzi scheme. It’s worse, as aptly demonstrated in this cartoon. And let’s not forget the famous Bernie Madoff cartoon. SS was never meant to be what it has become – when it was first started the average person died at 62 – now life expectancy is much higher than that. So it will go belly-up, it is just a numbers game. And like a ponsi-scheme when less comes in than goes out – it goes belly up. That is why people compare it to a Ponsi-scheme – but unlike a Ponsi-scheme we cannot opt out of it. The government has a gun to our head on this, and many other issues. I know that right now, I work much less than I could because I see no reason to pay more to the government – why save when they will take it either through inflation, or other tactics? It just isn’t in my best interest to work myself to death for others – so I will contribute less, and the whole thing will collapse faster. That is the only way to ensure that eventually they will come up with something that works – when the entire system collapses and true capitalism and the prosperity it can bring is embraced. Everyone should work as long as they can – and they should have true nationwide insurance that true competition sets the rates for – rather than having state-by-state deciding who is the winner and who is the loser by who pays them off the most. Obama listened to only the insurance companies when coming up with Obama-care – wanna know why? They are paying him and all the other politicians off, and you – the tax-payer will be left with nothing in the end other. SS is broke – the government took all of the extra and spent it – if there was a true saving bank, it would last another 30+ years, there isn’t. If they stop paying on SS – they have already defaulted since the replaced the extra money with bonds that are as worthless, as the word of any politician. SS might work if we treat it like an insurance policy – everyone pays a little, most people get back nothing. Rebecca if you need help, you’re obviously eligible for state assistance for food, medicine, housing, etc. – that’s what welfare is really for. Besides, in 20 years your kids won’t have any social security to draw on – what about them? Did you sue the doctor for malpractice? I’d think the settlement would have been huge. Good luck. I have End Stage Renal Disease and a fatal cancer in remission. Don’t know if I’ll make it another five years – it’s in God’s hands. I think our goverment needs to get a grip on reality! My husband & I rely completely on social security,medicare & medicaid! He was paralyzed,from the chest down in a local hospital, because a surgeon made a “MISTAKE” when trying to repair the staph infection in his back! Because of this I can’t work because I’m his caretaker & must be at home with him. Otherwise he’ll be back in the nursing home & who’s going to pay for this? At over $5,000 a month,wouldn’t be long before we would both be homeless. My health is so worn down I don’t think I could hold down a job if I had to! I’m not eligible for any health ins. & we can’t afford it.